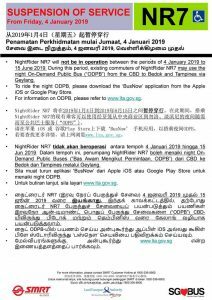 NOTE: NightRider NR7 is temporarily suspended from 04 Jan 2019 till 15 June 2019, as part of the On-Demand Public Bus trial. 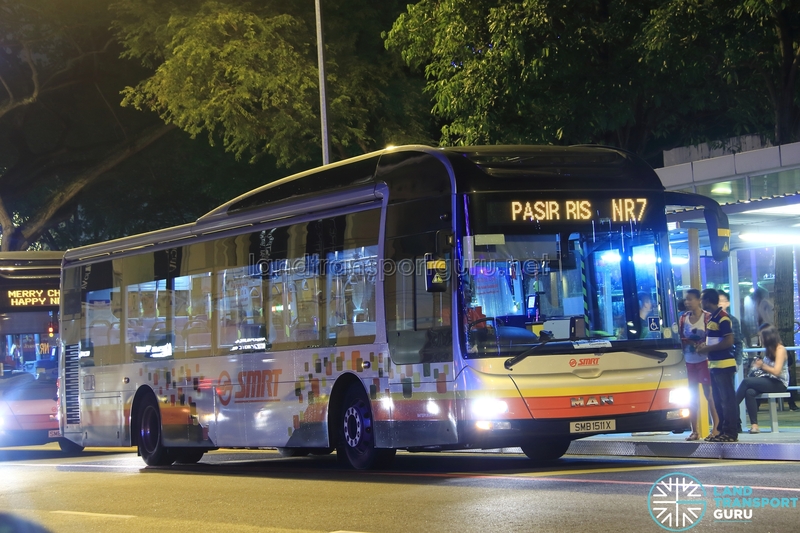 SMRT NightRider NR7 is an overnight bus route running from Marina Centre Terminal to Loyang Avenue, passing through City Hall, River Valley, Orchard, Victoria St, Geylang, Kaki Bukit, Bedok North, Tanah Merah, Simei, Tampines and Pasir Ris. 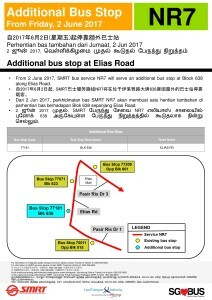 Operating on Fridays, Saturdays & Eves of Public Holidays, it is one of seven NightRider bus routes operated by SMRT Buses. 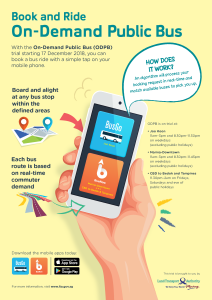 However, the route is temporarily suspended from 04 Jan 2019 till 15 June 2019, as part of the On-Demand Public Bus trial. 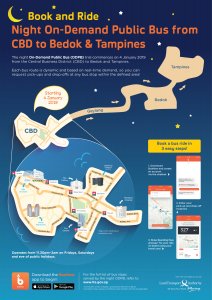 NightRider NR7 is a late-night service connecting the city areas of Marina Centre, City Hall, River Valley and Orchard with the residential estates of Kaki Bukit, Bedok North, Tanah Merah, Simei, Tampines and Pasir Ris. Operating only on Fridays, Saturdays & Eves of Public Holidays (and special occasions if announced), the route shuttles late-night dwellers from the City to the residential estates outside the City. A large portion of the route duplicates major trunk roads along the East-West Line. Before its route shortening in 2014, it was 76.3km long, the longest bus route in Singapore by distance, with Service 858 taking second place (73.4km). NightRider NR7 was introduced on 26th May 2000 by Trans-Island Bus Service (TIBS). 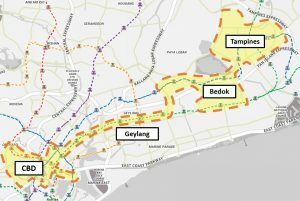 Originally a single-directional service from Marina Centre to Pasir Ris, it was later converted to bi-directional loop operation. 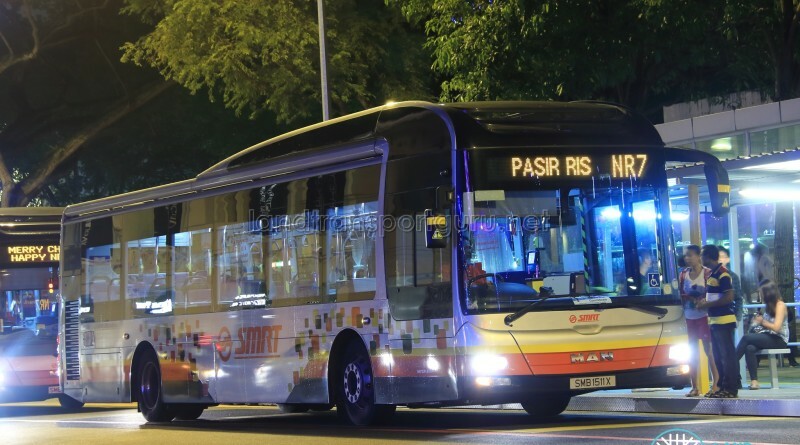 It offered daily unidirectional service in 2003 after merger with SMRT NightBus SN10 and NightRider NR8 (operating Marina Centre to Pasir Ris), with the existing Friday/Saturdays/Eves of PHs route amended to incorporate NightRider NR8’s routing. Weekday night services were cancelled in 2004 owing to low demand. Finally, the route was converted to unidirectional operation terminating at Pasir Ris in 2014. 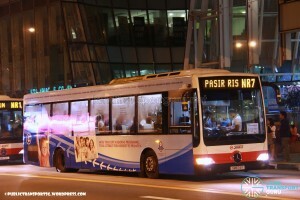 Commuters heading to Pasir Ris should take SBS Transit Nite Owl 4N during the ODPB trial period. 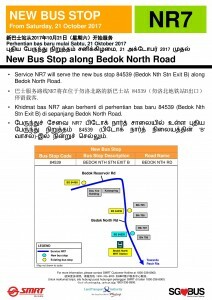 Alternatively, commuters who prefer regularly scheduled buses to Bedok or Tampines may take SBS Transit Nite Owl 2N or 4N. NightRider commuters who pay by ez-link card will enjoy a free transfer to another NightRider service within a stipulated time of 45mins. This is not applicable when transferring from an ordinary service to a NightRider service. Concessionary travel is not applicable. NightRider NR7 at a glance. Click for larger image. 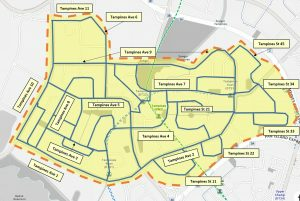 The Bus Service Operating License (BSOL) for this route will be renewed in 2023 under the Woodlands Bus Package. 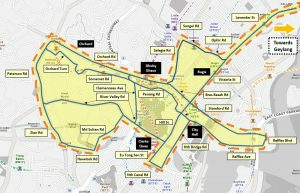 2003 (01 Jul): Merged with Night Service SN10 and NightRider NR8 to ply Victoria Street, Sims Avenue/Geylang Road, Kaki Bukit, Bedok North and Tanah Merah, removing previous sectors along ECP, Marine Parade and Upper East Coast. 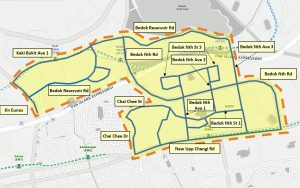 Also amended to ply Simei Rd and Simei St 3 replacing the full stretch of Simei Ave. At the same time, unidirectional weeknight departures from Marina Centre to Pasir Ris were operated to cover the withdrawn SN10. Services on Fridays/Saturdays/eves of PHs remained bidirectional. 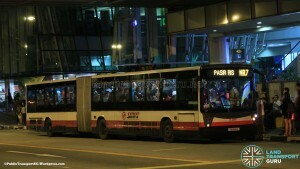 2014 (30 Apr): Converted to unidirectional operation from Marina Centre to Pasir Ris due to low ridership, terminating at Loyang Ave. Revised departure times from 11:35pm and 2:00am, and City-bound return services will cease to operate. 2017 (02 Jun): Calls at an additional bus stop (BS77181 Blk 638, Elias Rd). 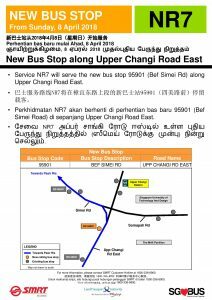 2017 (21 Oct): Calls at a new bus stop (BS84539 Bedok Nth Stn Exit B, Bedok Nth Rd). 2019 (04 Jan): Service temporary suspended to facilitate the Night On-Demand Public Bus trial.